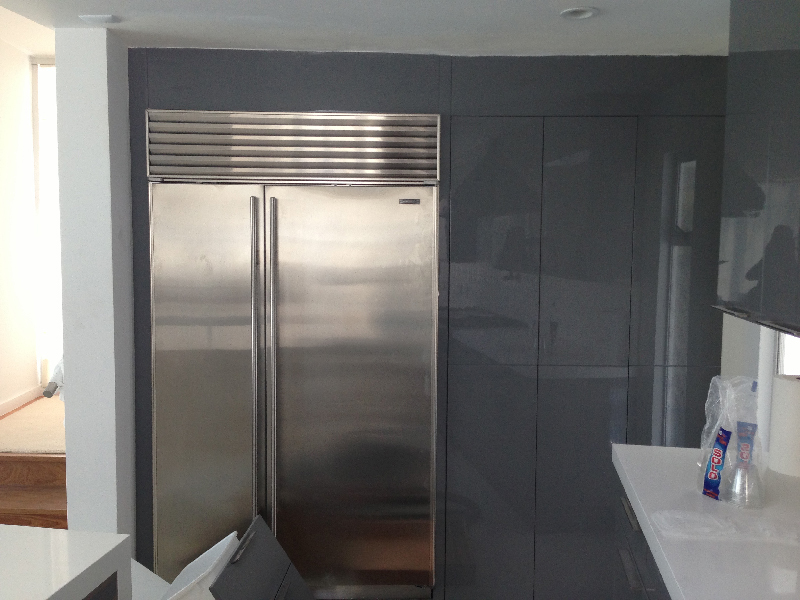 I wanted to share a few photos of a kitchen that we recently installed in the Trousdale Estates section of Beverly Hills. The kitchen is in a very unique mid-century modern home with terrazzo floors. Here is Peter from HSK with two of the installers hard at work. 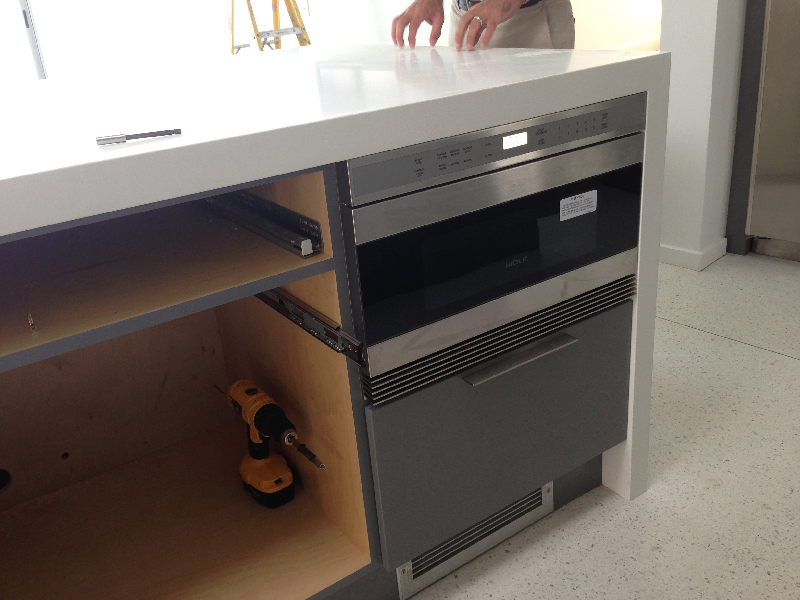 The large island has a waterfall edge detail on both sides and an overhang at the back for seating. 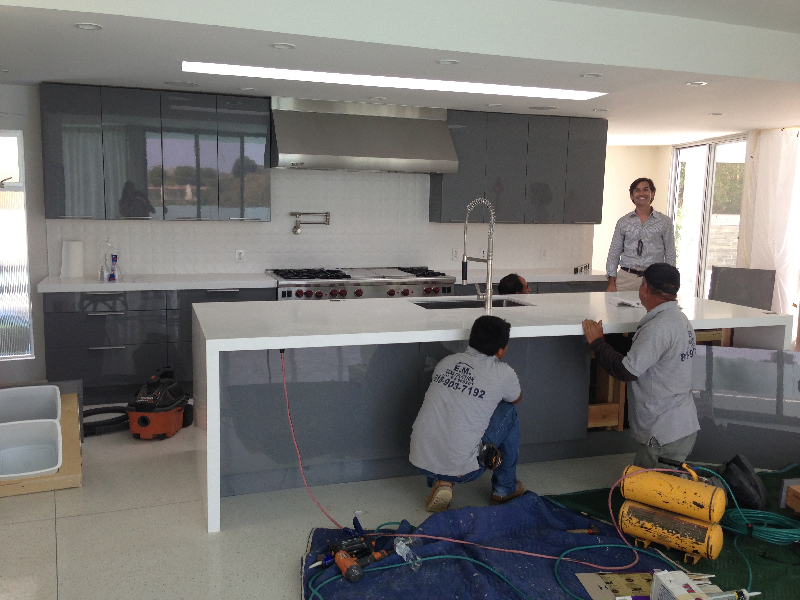 The countertops are “Pure White” Caesarstone. The island features a Wolf microwave drawer, shown below as well as a pull-out trash, sink, paneled dishwasher and drawer storage. The back wall features lots of wall cabinets and drawer storage. Centered is a Wolf pro style range and stainless steel hood. The backsplash tile is a textured white porcelain from Porcelanosa. 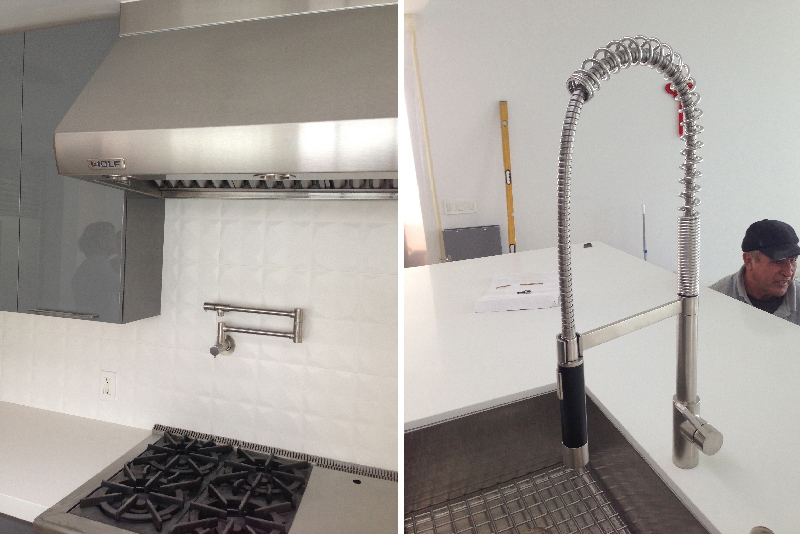 The industrial looking pull-down faucet is one of my favorites, the “Tara Ultra” from Dornbracht. 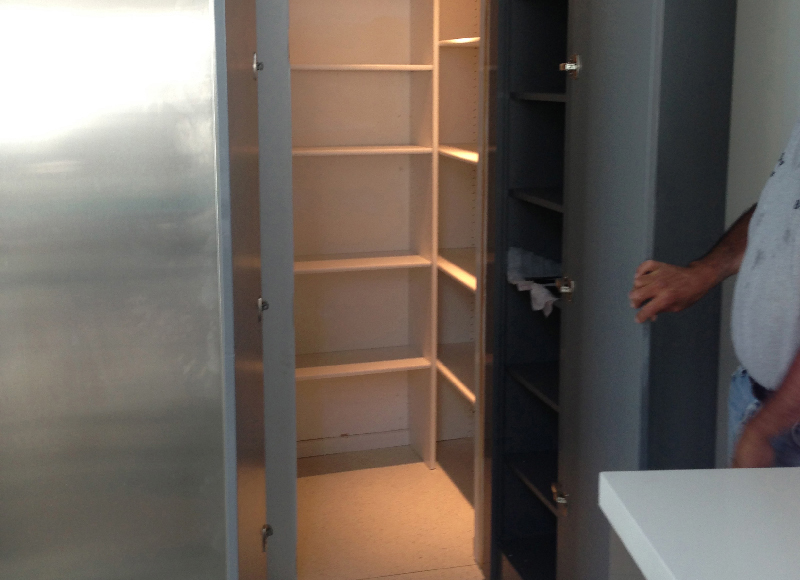 One of the really interesting features of this kitchen is the hidden pantry. The corner of the room has an angled dropped ceiling which broke up the clean lines of the space. We designed a door front assembly and a tall storage cabinet that when installed sideways would hide a small walk-in pantry as well as the obstruction. Below are the false doors to the right of the 48″ built-in series Subzero. When the same decorative hardware as the rest of the kitchen is installed on these doors they will resemble standard tall cabinetry. This is with the doors open, exposing the integrated storage cabinet on the right and the entry into the walk-in pantry. 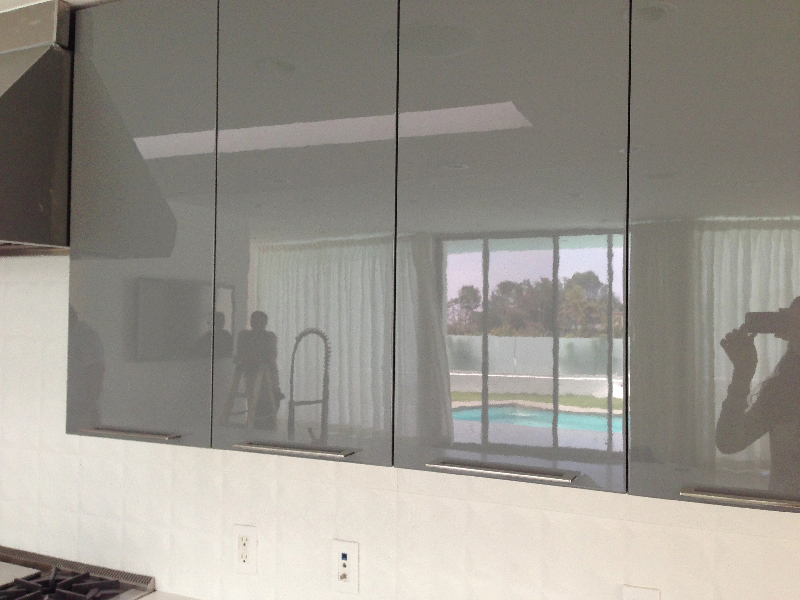 I love this photo, which shows the pool in the front of the house and also just how “high gloss” these cabinet really are! They are done in a custom gray by Dunn Edwards called, “looking glass.” We chose that color because it tied in well with the gray fireplace in the adjoining family room and the floors. The name is a bit ironic though since the 90% sheen is so reflective it’s almost like looking at glass. What do you think of this gray kitchen?